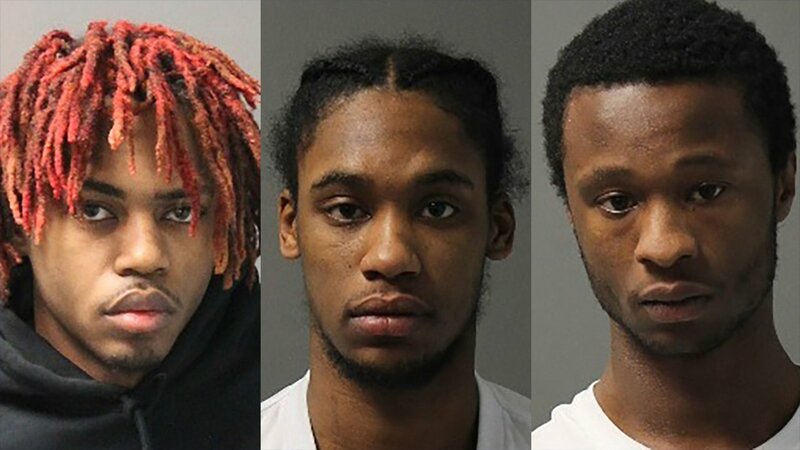 ELMHURST, Ill. (WLS) -- Three Chicago men have been charged after a series of burglaries Monday morning in Elmhurst. Police responded to a reported stolen car from a garage in the 600-block of Fay Avenue at about 5 a.m. Officers arrived on the scene and observed two vehicles. When they attempted to stop the vehicles, a chase began. The chase ended when one of the suspects crashed into a squad car near West Avenue and Gladys and narrowly missed a home. Another suspect drove across several lawns to get away then tried to take off on foot. After establishing a perimeter, three suspects were located in the 400-block of North Avenue, at North and Ridgeland avenues and the 400-block of West Avenue. A loaded handgun was recovered from the scene. A fourth suspect remains at large. The group entered more than 20 unlocked cars and several unlocked garages in North Elmhurst, stealing items from them and looking for cars with keys in the ignition, police said. On Tuesday, police announced that 19-year-old Tyrone Wilson, 23-year-old Deanthony Webb and 21-year-old Deonte Daniel have each been charged with three counts of burglary and possession of a stolen motor vehicle. All three appeared in DuPage County bond court Tuesday morning, where a judge set bond at $250,000.